Welcome to Citadel Record Management and Storage, Inc.! Citadel Mini Storage is a family-owned gated storage facility located in Jonesboro, Arkansas. We offer a range of unit sizes to fit every need and budget. We encourage you to look at our web site, visit us at our on-site office during business hours or contact us through our email form or at (870) 933-8124. 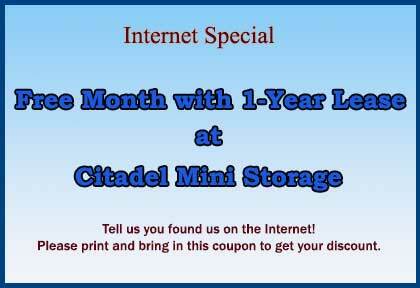 We appreciate your considering Citadel Mini Storage and look forward to the possibility of serving you!